- Publisher If we want Co learn about Jesus Christ our first port of call is usually the Gospels. Matthew, Mark, Luke and John tell us about Jesus' life on earth, but if we think that Christ can only be found in those four precious books then we are missing out on the big picture. 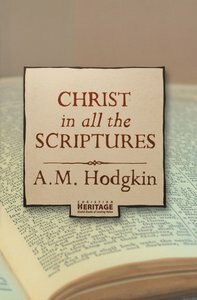 As the title suggests this book shows that the message and life of Christ runs through every part of Scripture. In the Old Testament we have prophecies of his coming and parallels of his sacrificial life, in the New Testament we have the realisation of Christ as the Messiah and the impact that this is going to have on the individual believer and the entire World. In this classic book, we are shown the breadth of impact of the Christ. Every book of the Bible is touched on, and we are shown that the Bible stands as a whole, a planned, inspired and flawless whole with a constant thread of God's rescue plan for man, rather than a disparate mosaic of books on unconnected issues. About "Christ in All the Scriptures"
If we want Co learn about Jesus Christ our first port of call is usually the Gospels. Matthew, Mark, Luke and John tell us about Jesus' life on earth, but if we think that Christ can only be found in those four precious books then we are missing out on the big picture. As the title suggests this book shows that the message and life of Christ runs through every part of Scripture. In the Old Testament we have prophecies of his coming and parallels of his sacrificial life, in the New Testament we have the realisation of Christ as the Messiah and the impact that this is going to have on the individual believer and the entire World. In this classic book, we are shown the breadth of impact of the Christ. Every book of the Bible is touched on, and we are shown that the Bible stands as a whole, a planned, inspired and flawless whole with a constant thread of God's rescue plan for man, rather than a disparate mosaic of books on unconnected issues.